I first had these meatballs a few years ago when my neighbors to the south of us moved into our neighborhood from Taiwan and invited us for dinner at their home. I liked them so much, I had to try and make them on my own, fashioning my own recipe. I still like to make them for my family, even though I don't eat meat anymore. This is what the box of rice powder looks like. They have it at 99 Ranch Market. A little goes a long way, and it's not expensive, only a couple of dollars. Mix all ingredients together for the meatballs except the rice powder. Next, get your steamer ready. 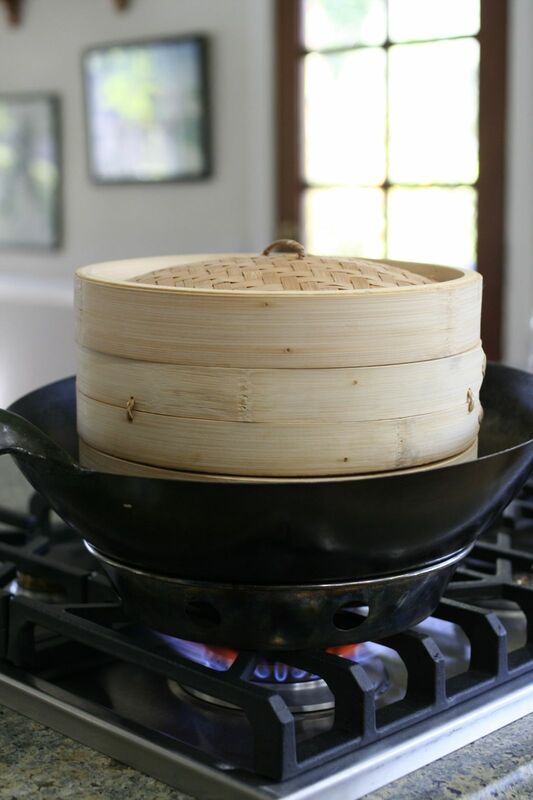 Prepare your steamer by covering the slats on the bottom with some cabbage leaves. I used nappa, but any kind of cabbage will do. Roll the meatballs and place them on the cabbage leaves. Then sprinkle a little of the rice powder on top. 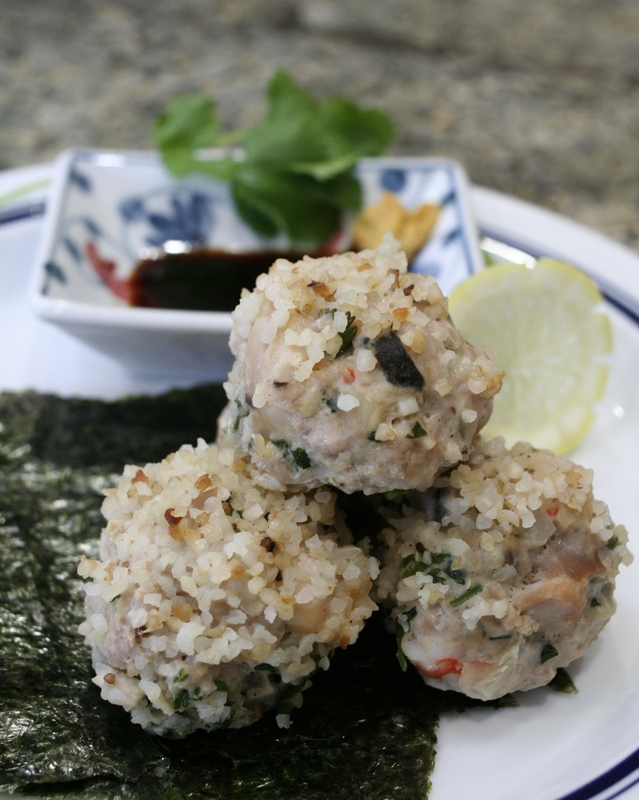 Remember when we made the Mushroom Sticky Rice? We're going to steam the meatballs like that, over boiling water in the wok, or using a steamer pan. When you're done with the first tray, set it to steaming with the lid. If you're using both layers of your steamer, when you're done with the second tray, put it on the bottom, next to the water, underneath the first layer. Be sure to use potholders so you don't get burned. The steam is hot, so best turn off the heat while you add the second layer. Check them after 15 minutes. 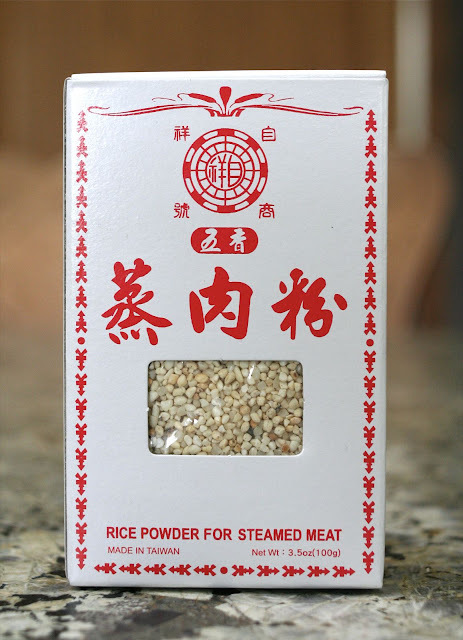 If the rice powder is not translucent, steam for a few more minutes, making sure there is always water in the pot and it doesn't boil dry. While you're steaming the meatballs, mix the dry mustard with water, a little at a time to form a soft paste. My dad always turned the container over for a few minutes when he was done mixing the mustard or wasabi. He says it makes the mustard hotter. Mix the hot mustard with a little shoyu in a small dish and dip the meatballs sparingly before eating. Serve as an appetizer or as a main dish with hot rice. Last night I got to meet one of my idols! 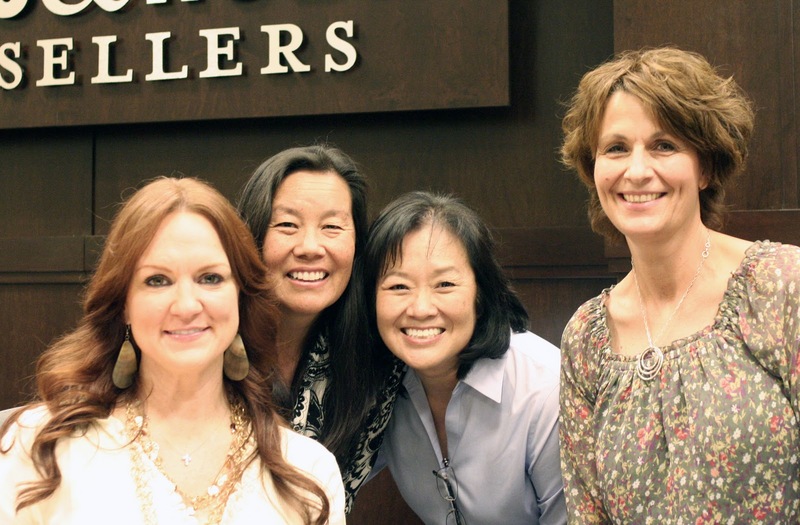 Ree Drummond, of The Pioneer Woman fame, was at Barnes & Noble for a book signing of her latest, Black Heels to Tractor Wheels. The girls and I had such a great evening out at The Grove, meeting Ree, and having dinner at Maggiano's Little Italy, that Connie said the flat tire they had after they dropped me off was laughable! Thanks for such a wonderful evening!